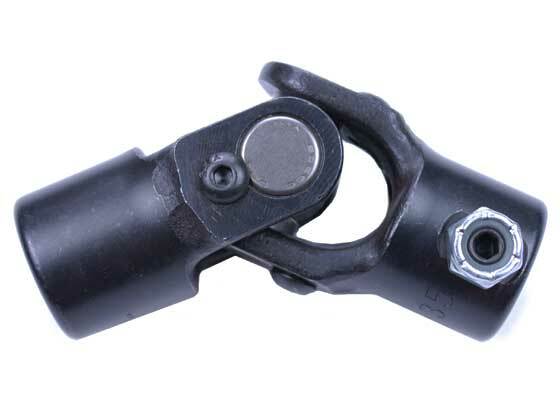 Eliminate unwanted slop in your shift linkage with these bullet proof U-joints from Weddle Industries. Nearly impervious to dirt, sand, and grit, these joints are designed to operate smoothly with zero slop, even in extremely harsh environments. Originally developed for NASCAR steering systems, these joints have been modified by Weddle to fit various models of shifters and transaxles. They are capable of a 32 degree working angle and have sealed needle bearings for easy movement and precise action. The sealed bearings keep out the grime and ensure that these U-joints perform flawlessly, even in the nastiest off-road conditions. Competition proven. Made in USA. Splined end attaches to shifter with set screw. Opposite end welds to 3/4" tubing.